Huck Seed was a former engineering student at CalTech. He took a leave of absence in 1989, started playing poker, and never went back to college. It is said that he is a native of Montana. While imposing at 6’7″ tall, his quiet and private nature go far beyond the poker table. Stone cold silent at the tables, very little is really known about the very private champion. Huck won won his first World Series of Poker bracelet in 1994 in a Pot Limit Omaha tournament. Two years later he won the WSOP Main Event, his second bracelet, and $1 Million dollars. 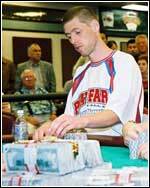 Huck returned to the final table of the WSOP in 1999, but finished 6th. As of 2004 he had a total of four WSOP bracelets. As of 2005, his live tournament winnings exceed $2,365,000. Huck is also well known as an avid proposition gambler, taking on bets outside of card play. He once made a bet with Phil Hellmuth that he could float on any body of water. There was $10,000 at stake and he was allowed to wear a wetsuit. Seed lost. He subsequently won the money back from Hellmuth by traveling all the way to Madison, Wisconsin, where Hellmuth lived, and defeating him at 9-ball for $2,000 a game. Hellmuth lost $24,000 that night. Holding K8 Van Horn initially raised with Huck calling quickly, when the flop fell 984 Huck went on the attack and bet, when Van Horn re-raised Seed pushed all in and Van Horn followed. An Ace on the turn gave Van Horn 12 outs including a straight draw, but the river bought a 3 and Huck’s 2 pair held up.